Do you remember James Taylor, Roger Smith, Mauri Sanchis, Kimo Cornwell, George Mitchell, Rickey Peterson? All artists are playing the legendary Hammond B3. 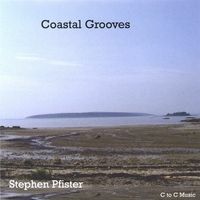 If you dig this sound don't miss Stephen Pfister's new album "Coastal Grooves". He has the ability to use his instrument in all its profoundness. Stephen Pfister played with Blues singer "Big Pete Pearson". Currently he lives and plays in the Downeast Maine region (Blue Hill, Bar Harbor and Bangor, USA) and writes, produces and records his own music. CD's since 2001 include "Less is More" and "Cold hands- Warm Heart". He cites the influence of Les McCann, Ramsey Lewis and Jimmy Smith with a little Dr. John thrown in. His third album is a brilliant concourse of Hammond B3 and piano. Stephen Pfister wrote and performed all songs. It's incredible that he reaches that high level of perfection doing all in self-mode. The album starts with Golden. Stephen lets the B3 sound grow and layers on this sound his piano grooves. Build Me Up/Help Me is the longest tune of this album but there is no filler. The piano melody is assessable and attractive. In between he builds a bridge with keyboards and organ returning to the lead melody on piano at the end of the tune. Personally I would prefer some variations of the rhythm. Using drum-loops is just an expedient. With Radio Friendly Stephen Pfister intends a certain promoting of his album on Americans smooth jazz radio stations. (Un-)fortunately the tune isn't preaching the BA formula of smooth jazz. (You're) Trying Too Hard is a midtempo tune with some sax background. Very relaxed. Strut is the funky alternative to mellowness. Sax, guitar and organ are building a creative funky soundscape. Stephen Pfister obviously profits from a solid experience as live performer. (I Can't Stop) Smiling is not a statement but a message. Happiness expressed in notes. A further Hammond B3 attack do you find on High Tide. Remember Brian Auger or Booker T. & The MG's? Sometimes artists are Just Foolin' Around in the studio. But this tune has a dynamic and clear structure. ChillOut has a promising intro while the piano played bridge is more improvised. Walking The Dog In The Rain isn't always a pleasure. Nevertheless Stephen Pfister enjoyed it with a reggae flavored uptempo tune with much coolness. Always when Stephen performs the Hammond B3 he is in his domain. Personally I consider this tune as his best on this album. Stephen finishes his album with a reprise of Golden. All is in the piano/Hammond mix. This album is definetely a feast and titbit for friends of Hammond B3.